On a beautiful Sunday afternoon, we drove up to Rome to attend an honor society induction and to have lunch with our daughter and her boyfriend. When you attempt to avoid chain restaurants in Rome, your choices are somewhat limited. 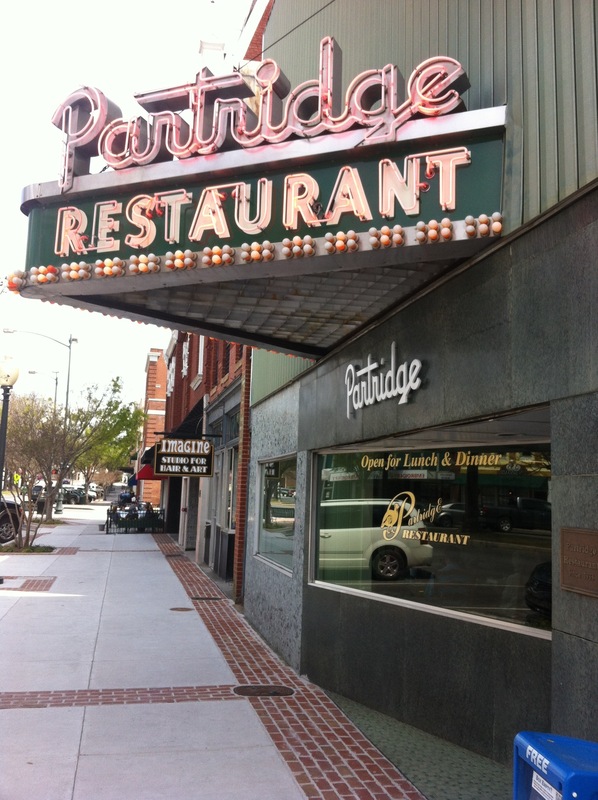 We headed downtown to Broad Street, likely headed to Jefferson’s or Harvest Moon, when the Partridge Restaurant was suggested. I had seen the Partridge on several occasions, but no one else ever mentioned it as an option. Nor did I hear about anyone who’d been there. But as it has been open since 1933, we figured that they must be doing something right (we discovered what during the meal). We were a little late for the right-after-church crowd, so there were plenty of tables available. It’s very much a home-style restaurant – the menu changes daily and has four or five meats, nine or ten vegetables and three desserts – and you can order one meat each, plus the veggies or plates for the table of all the meat options, plus the veggies. 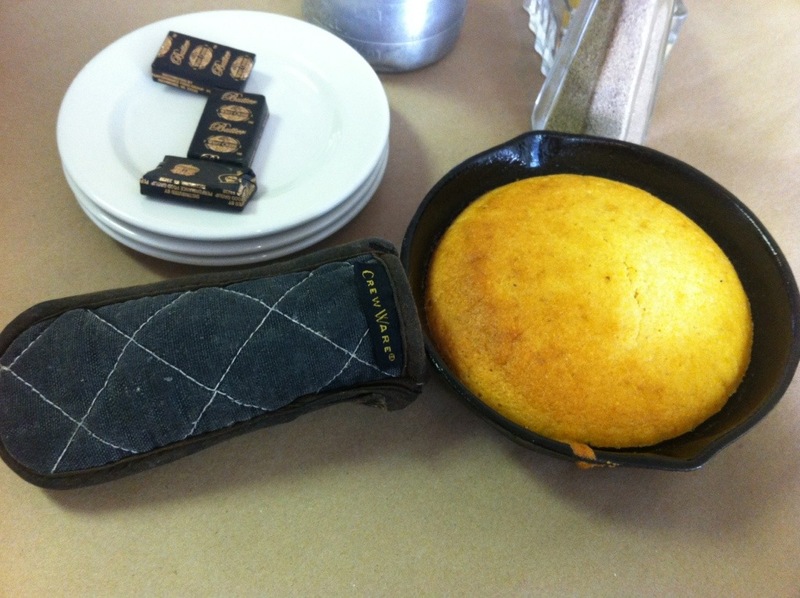 Before the meal, an iron pan of cornbread arrived, fresh enough from the oven that the hot pad around the pan handle was necessary. We decided to go full scale family style on this visit (we’ve been back since and ordered one meat each – on that visit my Dad ordered fried chicken livers, which he proclaimed among the best he’d ever eaten. Not being a fan, in the slightest, I believe that bar is naturally set very low). 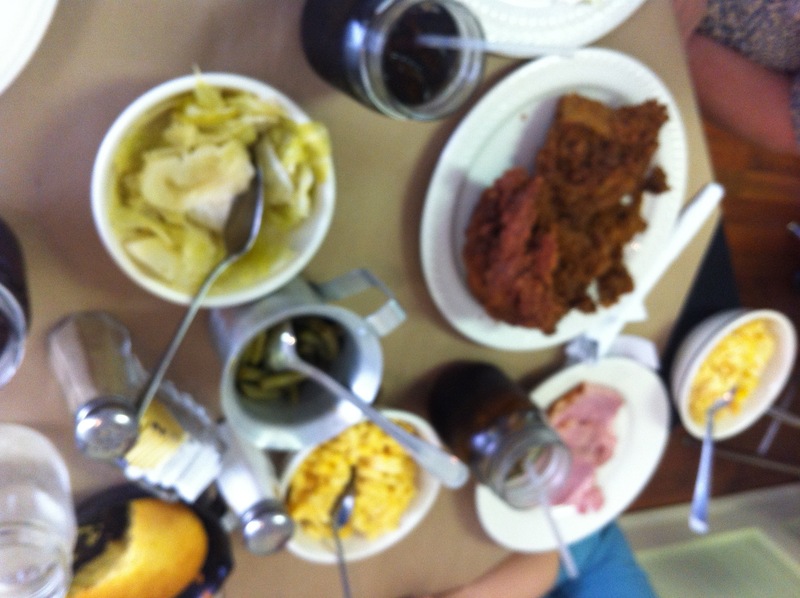 from the top left, going clockwise: steamed cabbage, fried chicken, creamed corn, baked ham and mac-n-cheese, interspersed with some drinks and assorted condiments. 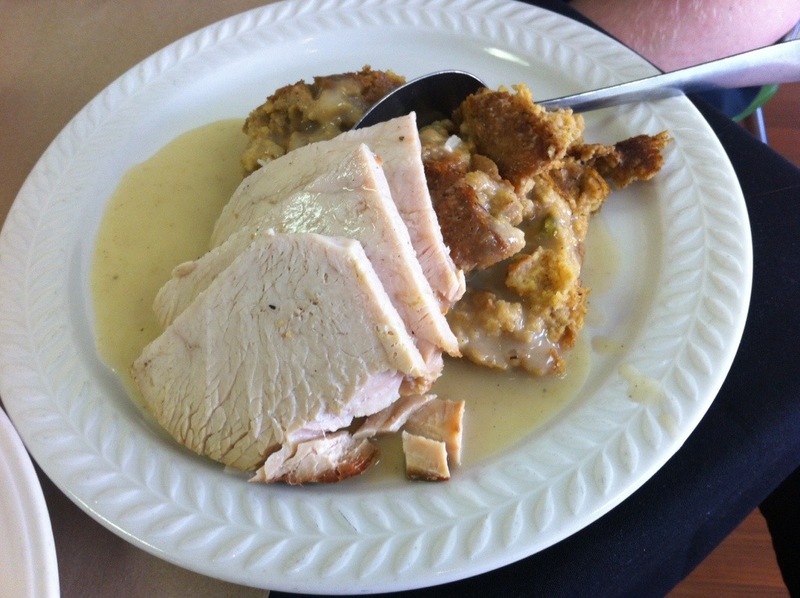 And here is the turkey and dressing. The food was easily equal to the quality of a Cracker Barrel, and parts (chicken livers according to Dad, the fried chicken, the squash casserole) were very good. We finished up the meal with two banana puddings (served cold and tasty) and two pear cobblers (interesting – close to apple but different – which only had a top crust). I noticed that several of the reviews complained about the speed of service or seating, but we definitely had speedy service, but your milage may vary.